Control any connected device on your WiFi network. Force customers to sign-in or pay on the login screen. 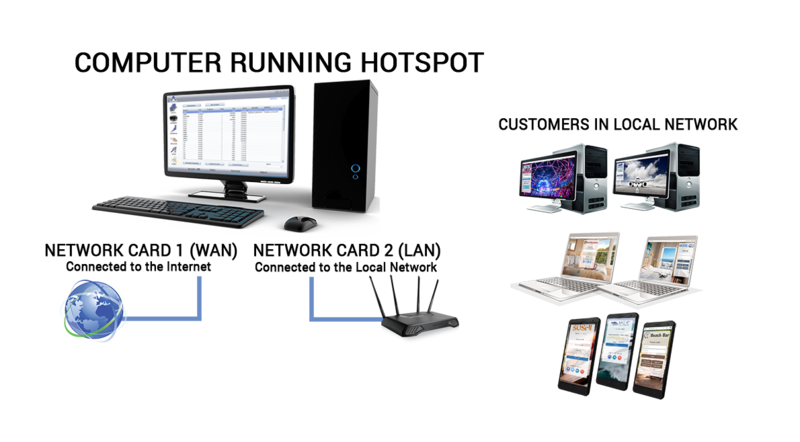 Configure the number of user devices that can access the Internet. Limit download and upload speed for each customer device. Set maximum available bandwidth quota. Sell high speed access for an additional fee, or save more bandwidth for VIP customers. If you already have access points, there is no need to change it. Our software works as a gateway with any hardware. You just have to route all devices through hotspot server running our software. Reduce download and upload speed for guests that consumes too much bandwidth. If limits are reached, guest will be switched to lower speeds preventing overuse and still providing basic service. All actions are monitored and tracked from the WiFi Hotspot app. For owner and administrators the Hotspot can provide all reports to desired Email address. You need a PC with two network cards which will run as a gateway for your network. Customers are redirected to your self-branded login page to sign-in or pay before getting the Internet access, or automatically login with remaining quota and time. Allow login with a keyword, social network account or collect user data. Configure limits like free access time, bandwidth, daytime, daily & monthly logins, expiration and pause between sessions. You decide how to provide Internet access. Charge by data transfer, time usage, or download and upload rate. Set pricing profiles and customer refills. Accept credit card payments for your WiFi service using any of the 70+ major payment gateways including PayPal. Credit Card Payment Module can be purchased for any edition. Connect HotSpot with over 30 Hotel PMS software including Opera, IDS, Medallion, Protel, InnQuest. The interface helps your guests sign up for the Internet access and post charges to the room. Who is Using Windows WiFi Hotspot App? Scalable from 1 room to 1 city, our software helps you easily start and grow. Maintain customer accounts, accept credit card payments with 100% of profits, store billing data, statistics and usage reports, all within a single application. Build your WiFi and wired network with any hardware you already own. Internet service providers may easily control Internet use, create complex price plans, bill customers through 70+ reputable payment gateways, maintain customer accounts and get robust reports on billing, usage, bandwidth, URL logs. It supports wired and wireless connections and it’s hardware independent. Comply with anti-terrorism laws by recording every customer session time, IP, MAC, and URLs visited. Offer free Internet, paid, or both, our software takes care of customer Internet use through WiFi, room cable, mobile phones. Additional Operator interface helps reception staff easily generate new tickets. Increase your revenue and customer loyalty by offering free Internet, offer Hi-Speed access for larger orders, or VIP Internet access for regular customers. Software automatically stores customer details and visited URLs and fully comply with anti-terrorism Pisanu Law and EU DIRECTIVE 2006/24/EC. Real time customer activity shows download, upload, remaining data transfer, time usage. Activity is updated each second for each customer account, IP and MAC address. Block or redirect unwanted websites from being accessed on your hotspot, based on predefined 90 categories like adult, drugs, weapons, gambling, phishing, violence, virus infected etc. Easily generate accounts and perform various tasks with Hotspot API (HTTP GET query and XML response), which offer very short integration time. Educational institutions grants students and visitors limited access, usually monthly renewable and with daily limitations. Block access to adult websites, integrate with Active Directory, or configure Windows Hotspot software to limit bandwidth per user, track usage logs and get real-time statistics. Efficient control over the expensive satellite broadband and guest WiFi access management. Prevent excessive downloads, bill by the data transferred, offer free trials or create different account levels with optional limitations like max daily transfer, time or number of logins. Reduce bandwidth requirements, log visited URLs, prevent personal Internet use during working hours by limiting access to YouTube, Facebook, and other websites you define. Offer secure login and optionally force visitors to enter personal data before granting Internet access. Provide HotSpot WiFi connectivity for guests and people on the move. Help them do the business remotely, handle reservation systems, check weather forecasts, manage rentals, stay in touch with home security. Automatically send Email marketing campaigns: send welcome emails on signup, promo email after 2 days, reminder after a week. Offer upgrades, special promotions, all automated. Offer coupons to customers who wants to take advantage of sales promotions at retail stores. Display coupons on the welcome page in exchange for customer name and E-mail. Collect customer data using Social login or signup form that may collect: name, email, phone, address, etc. Those details can be used for automated email campaigns from the WiFi Hotspot app and to promote service, or new products. If you are looking for Android-based app, please check mobile hotspot app. It can be used for personal pocket hotspot, 10 users max, not suitable for professional deployments.